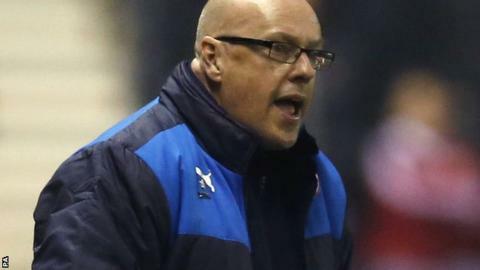 Reading manager Brian McDermott denied seeing two of his players clash with each other during Tuesday's 2-1 defeat at Championship leaders Middlesbrough. Royals captain Paul McShane and team-mate Danny Williams had a visible confrontation during the second half. "I didn't see it," McDermott said when asked for a view after the game. "But, I do know that these guys want to win." Reading lost to a late Adam Forshaw goal shortly after Matej Vydra had missed a chance to seal an away win. "I've seen players in dressing rooms that have won leagues (doing things) that you wouldn't know about. "I don't really want to talk about it. That's what winners do, they want to win. "They were gutted at the end, we all were." In a lively post-match interview with BBC Radio Berkshire's Tim Dellor, McDermott also refused to criticise Czech Republic striker Vydra for failing to convert a late chance. "I'm not here to pillar one person," he added. "We're sick for Matej Vydra, we're sick that it hasn't gone in the net. "We're absolutely sick to lose the game. If we hit the target there, we win the game. It's a real disappointment that we haven't won the game." Reading stay 14th after the defeat and still require one more point to be mathematically safe from relegation.